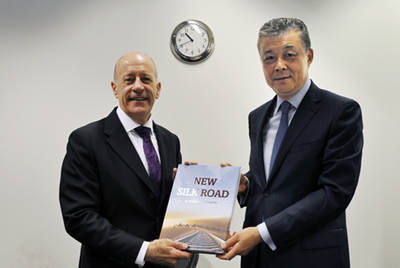 On June 27, 2017, Ambassador Liu Xiaoming met with Jules Pipe, the Deputy Mayor of London, at London City Hall. Ambassador Liu first extended his deep condolences to the victims of the massive fire at London's Grenfell Tower and his deep sympathies to the bereaved families and the injured. Ambassador Liu said that after the fire, Chinese President Xi Jinping and Premier Li Keqiang sent messages of condolence to Her Majesty The Queen and Prime Minister Theresa May respectively, expressing the deep and sincere condolences of the Chinese government and people over the casualties and losses in the fire. They also hoped that life will be back to normal for all those affected as soon as possible. On behalf of Mayor Khan and Greater London Authority, Pipe expressed appreciation to Chinese leaders and Ambassador Liu for their sincere condolences. 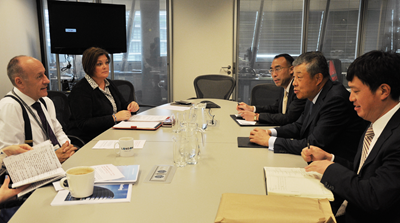 Ambassador Liu went on to note that the friendly cooperation between China and Britain has developed rapidly in recent years. And the leaders of the two countries have determined to jointly forge a global comprehensive strategic partnership for the 21st century and work together to build the "Golden Era" of China-UK relations. The UK is vigorously involved in the Belt and Road Initiative and takes the lead in joining the Asian Infrastructure Investment Bank (AIIB) as an important partner of the Initiative. The Initiative, with its great potential and broad prospects for cooperation, will create a new opportunity for China-UK relations. Pipe spoke highly of the good momentum of the mutually-beneficial cooperation between the UK and China, and looked forward to the fruitful outcomes from China-UK cooperation in the Belt and Road Initiative. He said that Mayor Khan and himself would attend the opening ceremony of ABP London project the day after, which would be another new outcome of the cooperation between the two countries.